be quiet! introduced the Straight Power E9, a new series of power supplies with 80Plus Gold rating. It includes 400W to 700W units with fixed cables, and 480W to 680W models with modular cables. Prices range from 79.90EUR to 139.90EUR. Be quiet!, market leader in Germany for five years in a row*, announced today the release of its all new Straight Power E9 line. be quiet! 's best selling line of power supply units (PSUs) has been upgraded in every power range including a new 135 mm cooling system and 80 PLUS Gold certification. Furthermore, for the first time the Straight Power line boasts a five year warranty on all models in the new E9 series. 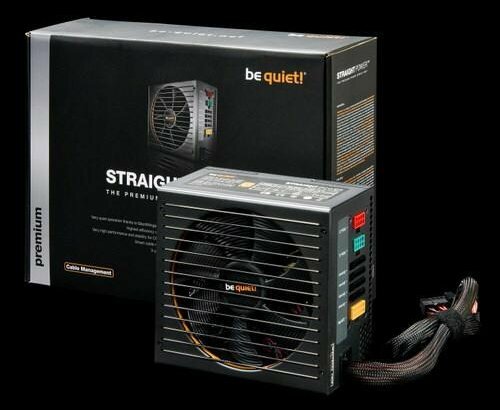 The previous generation Straight Power E8 became the best sellers for be quiet! receiving over 29 Awards from test sites and journalists internationally. Now, be quiet! is introducing the next step in the Straight Power series. The German based company and design team was focused on improving the earlier product in every critical performance parameter. The new Straight Power E9 series features a newly redesigned cooling system with a 135 mm be quiet! SilentWings fan with fluid dynamic bearing. This system provides vital cooling functions at inaudible levels and extremely high reliability. Even at full loads they are among the quietest PSUs in their range thanks in part to the low noise fan grille and anti-vibration mounting. Further reducing noise and vibration every fan blade is tared out individually using tiny weights to eliminate unbalances. Additionally, the design team takes audible noise even lower by eliminating extraneous sounds inside the PSU by modifying electrical and mechanical components. All the E9 models come with 80 PLUS Gold certification with efficiencies up to 93%, resulting in lower cost of ownership and cooler operation. Even the lowest power model with 400 Watts is gold certified, which is unique within the industry as lower power output makes it more difficult to reach the necessary levels of efficiency. This was made possible by using a new topology called "Active Clamp + SR (synchronous rectifier)". Newly designed IC controllers are constantly monitoring the PSU and intervene dynamically to eliminate inefficiencies. Previous topologies use passive components, which don’t as readily adapt to changing load situations. Together with vanishingly low standby power drain below 0,3 W the new Straight Power E9 combines power, efficiency and environmentally friendly design. Straight Power E9 models feature four independent 12 V rails to ensure best distribution of power, the 400 Watt model has three. It is no problem to power multi graphic processor systems with these power supplies, the series having both AMD CrossFireX or NVidia SLI certifications on appropriate models. And they provide maximum built-in safety protection to safeguard valuable components and data; over current (OCP), over voltage (OVP), under voltage (UVP), short circuit (SCP), over power (OPP) and over temperature (OTP). Once again, be quiet! gives consumers the popular choice of with or without cable management. The regular version with fixed cables comes in five models: 400, 450, 500, 600 and 700 Watts. The three models with cable management, which allow users to customize the cabling inside their PC, range from 480 to 680 Watts. Estimated prices (including VAT) start at 79,90 € for the 400 W version and range up to 139,90 € for the 680 W version with cable management. All Straight Power E9 power supplies are shipping now.